Each element in the breadcrumb can be selected and actions can be invoked through a context menu or keyboard short cuts. Furthermore the breadcrumb lets you navigate to other elements via drop-downs. 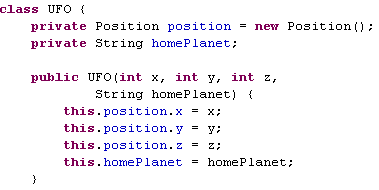 The Javadoc hover can now be used to navigate Javadoc. To enrich a hover either press F2 or move the mouse into the hover. You can configure how to enrich the hover on the General > Editors > Text Editors preference page. The problem hover now offers all available quick fixes for a problem and shows a tool bar on F2 or when you move the mouse into it. Quick fixes can be executed by clicking on the links. The actions in the tool bar let you configure the annotation preferences and the problem severity. Content Assist (Ctrl+Space) has been improved in several areas. The required cast will be inserted when such a proposal is selected. The required import will be added when such a proposal is selected. This can be configured on the Java > Editor > Content Assist preference page. Create getter and setters: Available on fields. Extract to method: Available on expressions and statements. Extract to local variable without replacing all occurrences: Available on expressions. Use StringBuilder for string concatenation: Available on string concatenations. StringBuilder is used in Java projects with a 1.5 or higher compliance, StringBuffer is used in projects with a lower compliance. Use MessageFormat for string concatenation: Similar to convert to StringBuilder, MessageFormat is used to replace string concatenations. A set of templates have been added to provide code building blocks for SWT widgets. To add, for example, an SWT button, type Button and press Ctrl+Space, select the Button SWT template, and press Enter. New template variables have been added and existing variables have been improved. Consult the Template Variables help page for a detailed overview. 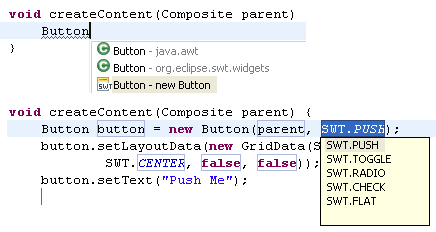 It is now possible to specify the location where Java editor templates are applicable. Statement location: The template shows up only when completing a statement. Type member location: The template shows up only when completing a type member. As a result, Content Assist (Ctrl+Space) will only show templates applicable at the current location. A new save action allows to format the edited lines on save. With this option enabled, format on save generates a minimal amount of changes, even on unformatted code. 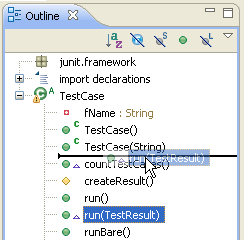 To enable this feature go to the Java > Editor > Save Actions preference page and select Format edited lines. For normal Java projects, the quick fix will search in other projects for the type and offer to add the JAR that contains that type to the build path. For PDE projects, information from the plug-in manifest is used to offer a new plugin dependency. Other project types can add their fix proposal through a new extension point. 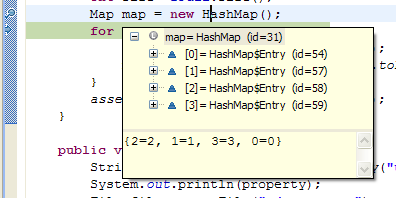 The Java editor can now show numbers with their own custom color. The color can be configured on the Java > Editor > Syntax Coloring preference page. The Javadoc hover and the Javadoc view now show the constant value of static fields. Mark Occurrences (Alt+Shift+O) now marks read and write accesses with different colors. 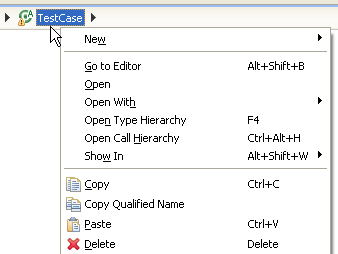 The quick menu (Ctrl+Shift+U) now only shows the searches applicable for the current selection. If only one search kind is possible, the shortcut will directly invoke the search. The menu now offers all searches available by Mark Occurrences. Matches are now highlighted with different colors for read and write accesses in the search view. The search view offers a Link with Editor mode where the view input is connected to the current editor selection. Extract Class replaces a set of fields with a new container object. All references to the fields are updated to access the new container object. This refactoring helps to group fields which logically belong together. To execute the Extract Class refactoring, select a type and invoke Refactor > Extract Class. Correct indentation: Corrects the indentation of your source code. 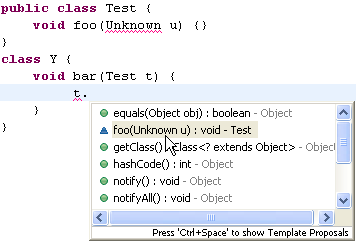 Add unimplemented methods: Adds code stubs for all unimplemented methods. Add unimplemented methods is most useful after adding a new method to an interface. 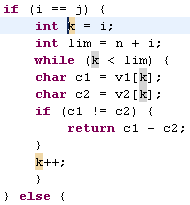 Correct indentation is also available as save action. To clean up your code select a set of Java elements and invoke Source > Clean Up. Refactorings now flag references to the refactored element inside compiled class files. Such references cannot be updated and would lead to problems at run time. Formatting a set of Java elements, e.g. via Package Explorer, can now be undone using Edit > Undo Format (Ctrl+Z). This can be configured on the Java > Code Style > Formatter preference page. The Eclipse Compiler for Java is now taking advantage of the multi-threading capability of multi-CPU machines. Our measurements show improvements up to 30%. Results depend on the JRE and platform used. Class folders located outside the workspace (external) can now be added to the build path. 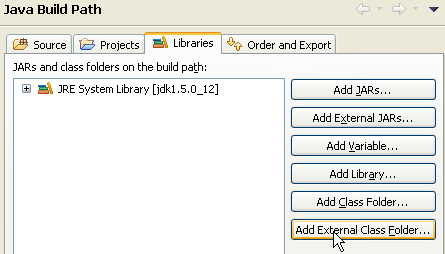 To add an external class folder use the Java Build Path page of the project properties, select the Libraries tab and push the Add External Class Folder button. Unnecessary declaration of thrown exception can now be ignored if it is documented with an @throws or an @exception tag. 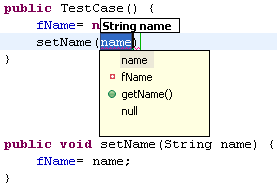 A Quick Fix (Ctrl+1) helps adding the Javadoc tag. Unnecessary declaration of thrown exception can now report warnings for unused declarations of 'Exception' and 'Throwable'. A warning is issued if no such exception has been explicitly thrown in the code. Null pointer accesses are now reported as a warning by default. Unnecessary @SuppressWarnings annotations are now detected by the compiler. Note that @SuppressWarnings("all") is still silencing the warning for unnecessary @SuppressWarnings, as it is the master switch to silence all warnings. Redundant superinterfaces can now be detected by the compiler. The unnecessary code can be removed by using Quick Fix (Ctrl+1). You can configure this settings on the Java > Compiler > Errors/Warnings preference page. The Java compiler can now create CLDC 1.1 compatible class files. It is now possible to add ZIP archives to the build path with file extensions other than .zip or .jar. It is now, for example, possible to add a .rar file on the build path. 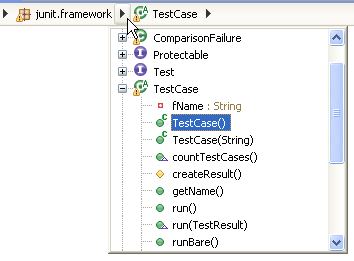 The JUnit view now shows the elapsed time for test cases and test suites. Icon corresponding to the current input. Actions to go back and forth in the history. Action to enable and disable link with selection. Action to open the current input in an external browser. Unsorted views like the Outline view and the Members view in the Java browsing perspective can now be used to rearrange members by drag and drop. The Runnable JAR File Export wizard can create a JAR file based on a launch configuration. 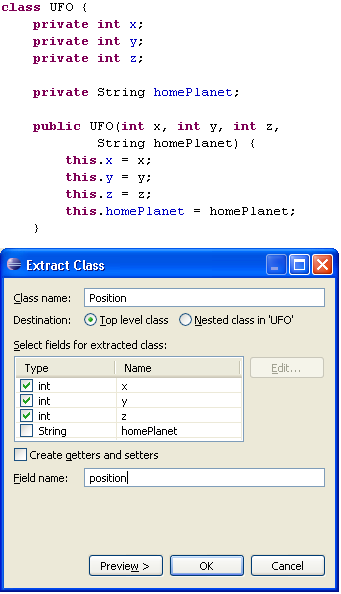 The generated JAR file contains all class files from the project including class files from required JARs and projects. or, on most operating systems, by double-clicking the file. The export wizard can also create an ANT script which can be used to build the JAR. 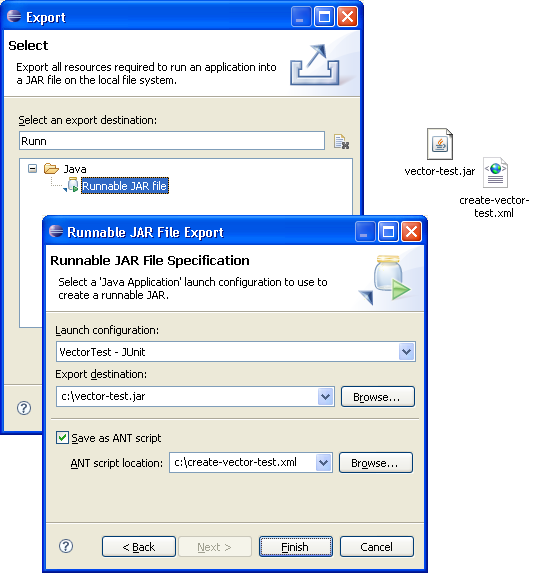 Invoke File > Export... and then select the Java > Runnable JAR file wizard to create such a JAR file. 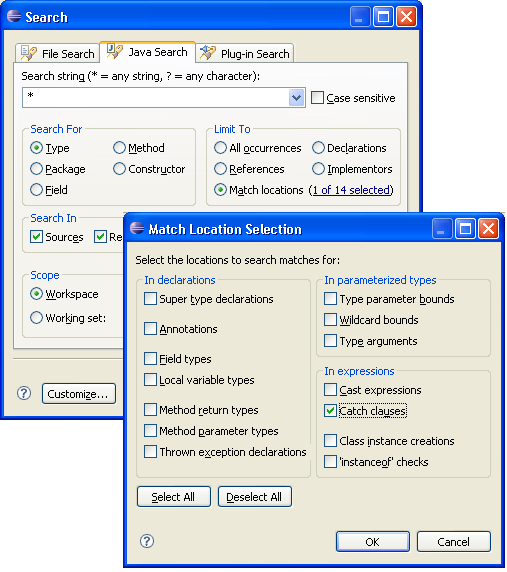 Type reference search can now be limited to specific match locations in the code. For example, you can find references in cast expressions, or in field and local variable types. Paste (Ctrl+V) in the Package Explorer view now supports members and statements. 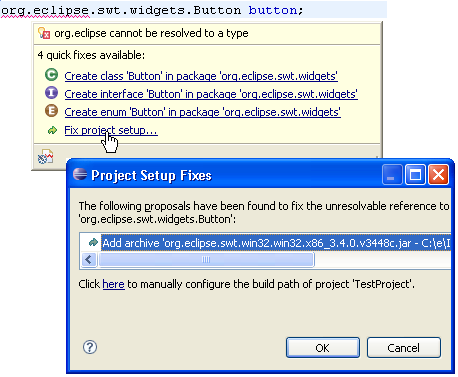 Eclipse creates the required enclosing elements for you. 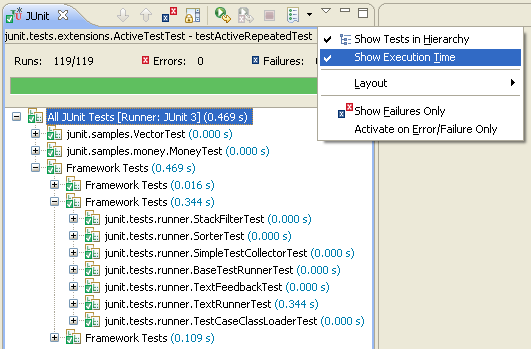 When debugging, hovers for variables have been enhanced to display an object inspector. The inspector will display logical structures according to the toggle setting in the visible Variables or Expressions view. An execution environment description file describes a JVM and the environment it represents (see Execution Environment Descriptions for detailed information on the file format). The file defines JVM properties such as boot path, endorsed directories, language level, executables, source attachments, and so on. 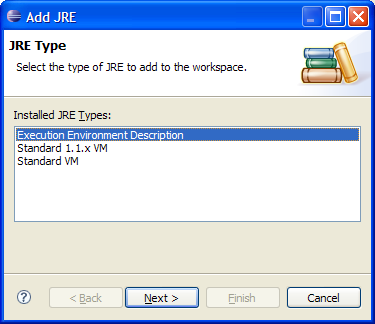 You can now add JREs to your workspace using execution environment description files from the Installed JREs preference page. 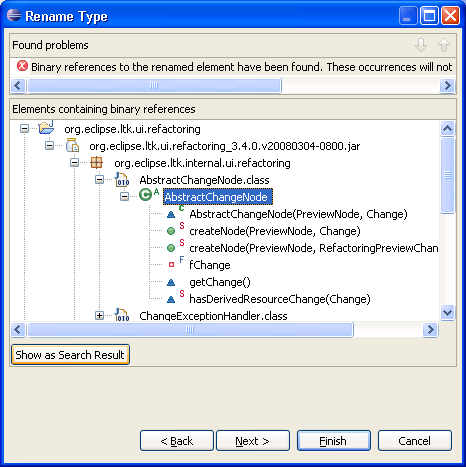 Press Add and select the Execution Environment Description JRE type. On the following page specify an .ee file. This will create a JRE with attributes from the description file. This example shows J9 configured for Foundation 1.1. 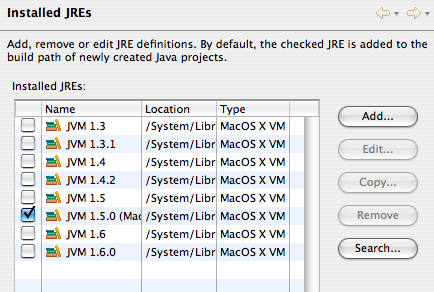 You can now search for all installed JREs on Mac. 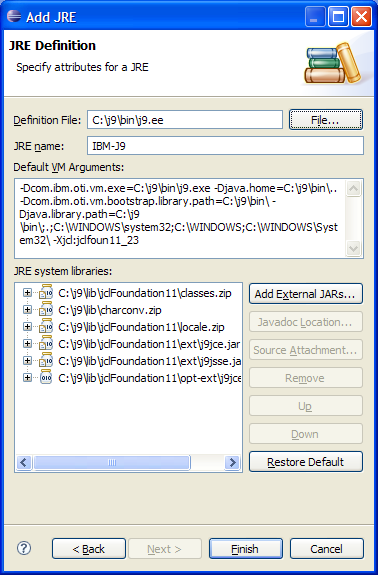 Pressing the Search button on the Java > Installed JREs preference page will add definitions for all VMs installed in the operating system's default location (/System/Library/Frameworks/JavaVM.framework/Versions). Launch configurations now appear when searching for references to a main type. Double-clicking on the search result opens the launch dialog on that configuration. 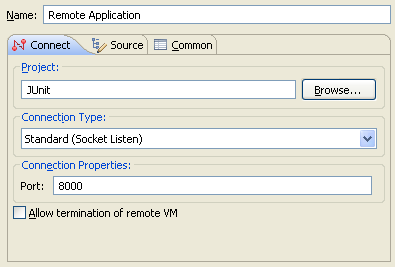 A socket listening connector has been added to the Remote Java Application launch type. This allows you to start the Java debugger listening for connection on a specific socket. The program being debugged can then be started with command line options to connect back to the debugger. Select "Standard (Socket Listen)" in the connection type drop down. You can now control the suspend settings for newly created watchpoints. A watchpoint can suspend execution when a field is accessed, modified, or both. The new preference is available on the Java > Debug preference page.